Judge Frank E. Hunter, was a native of Bloomington and a graduate of Indiana University. His father, David Eckley Hunter, was a prominent educator of Indiana, and was a son of Hiram Abyff Hunter who was one of the pioneer Cumberland Presbyterian ministers and circuit riders of southwestern Indiana and northwestern Kentucky. His mother was Elizabeth (Mitchell) Hunter, whose parents were among the early settlers of Monroe County, Indiana, coming from Kentucky, her grand-father, John Ketcham having resided in the old fort at Brownstown, before peace was made with the Indians. John was educated in the public schools of Indiana, having graduated from the Bloomington High School in June 1875 and from the Indiana University June 13, 1879 receiving the degree "Bachelor of Arts." In June 1883 the faculty of the Indiana University conferred on him the degree "Master of Art." He was admitted to the bar at Bloomington, Indiana April 2, 1880 and to the Supreme Court of Indiana and the United States District and Circuits at Indianapolis on April 18, 1882. After practicing law in his native town for a few months the building in which his office was located was burned to the ground in March 1883 and he lost everything he possessed. He then immigrated to El Paso, Texas September 26, 1883 an has resided here continuously ever since. He was admitted to the Bar of El Paso County in October 1883 at Ysleta the then County Seat. On Nov. 17, 1886 he was married to Miss Minnie E. Howe at Bloomington, Indiana. They have one child, a son, Herbert Howe Hunter, born in El Paso, June 25, 1888. 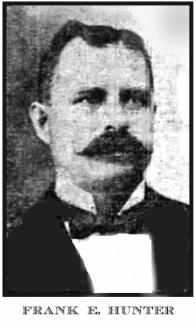 He was elected County Attorney of El Paso County in November 1884 for two years, and County Judge in November 1892 and 1894, retiring from the bench voluntarily in November, 1896. In February 1897 he was installed as grand master of the Independent Order of Odd Fellows of Texas and served till February 1898. He was the first Department Commander of the Patriarchs Militant I.O.O.F. of Texas and served as grand Representative from Texas to the Sovereign Grand Lodge (I.O.O.F.) for the years 1900 to 1904 inclusive. Bloomington (Indiana) Evening World, May 13, 1931, p. 1. Burial: at Evergreen Cemetery in El Paso, Texas.